This year marks the 30th Anniversary of the popular Super Mario Bros. video game launching on Nintendo’s first home console in the US, the NES. Nintendo recently launched this page to celebrate 30 years of Super Mario but I noticed some glaring omissions – his stints in the arcade. Seeing how the character got his start in our beloved realm of video gaming, let’s go outside of Mario on home consoles and check out his history – both Super and Non-Super – at the arcade. 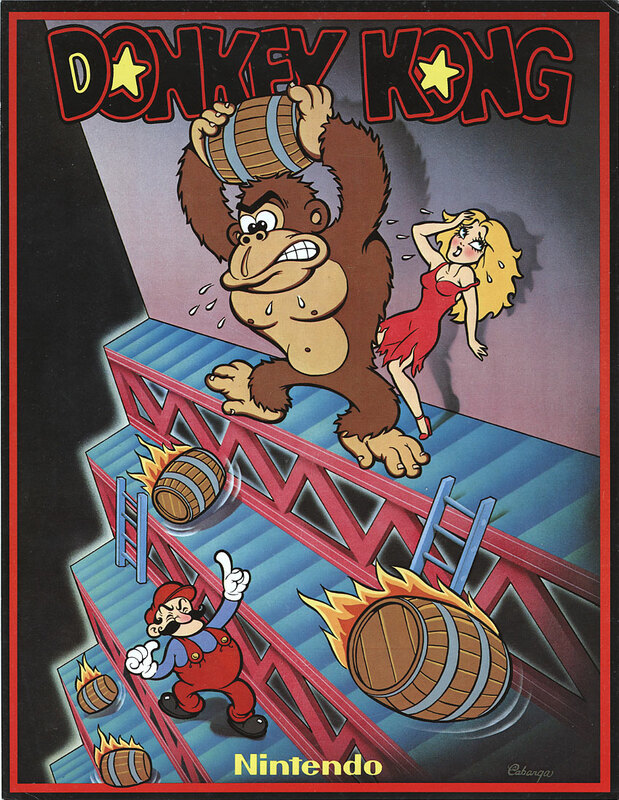 1981 – Donkey Kong – The character’s original appearance was from Shigeryu Miyamoto’s Donkey Kong. Here he was known as Jumpman and not Mario, that evolution would take place a couple of years later. His profession was also different in this introductory title, here he was a carpenter and not a plumber. As such this might be why this isn’t mentioned on the Super Mario celebration site, since he wasn’t Super yet. He also turned into the villain for Donkey Kong Jr. (and skipped Donkey Kong 3, where ‘Stanley’ was the hero). Still, this instituted Mario’s run ‘n jump nature along with the constant battle over rescuing a damsel in distress. 1983 – Mario Bros. – Jumpman was a name that only a mother could love and with the character going to be the real star of a new arcade title, “Jumpman Bros.” probably didn’t sound quite right. This new game was also taking place in the sewers of New York so it made more sense to change Mario’s career to a plumber. Regular Mario Bros. may not be remembered as fondly as the Super version since it was only a single screen platform jumping game that also was released in the middle of the crash era, where many games regardless of their quality would be overlooked. This also introduced the brother, Luigi and enemies like the turtles (called shellcreepers, which later evolved into the Koopa Troopas. You could not pounce on them in this game). This also received a “Vs.” release, which was an NES conversion kit for existing arcade machines like Donkey Kong or Popeye. NES hardware was modified for both Vs. and PlayChoice games, thus they would not have as much graphical power at their disposal. Because the hardware was practically the same, this would allow for various NES titles to show up in the arcade, they just would not always look on-par with the dedicated arcade releases. 1985 – Super Mario Bros. – Of course there was the game that “started it all” on the NES. Not much needs to be said about the game itself since it is so well known but I do recall the first time I came across it at a neighbor’s house, which was when Nintendo Fever blasted off in my neighborhood. 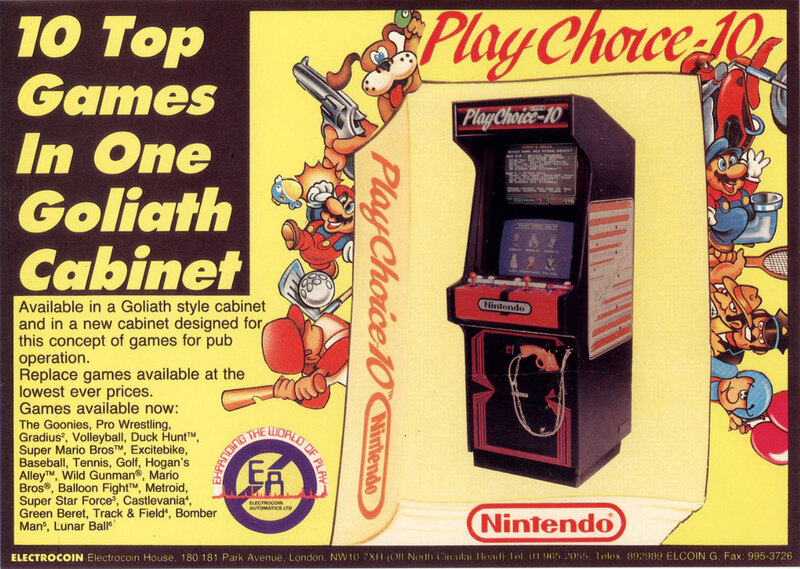 Nintendo still had a solid arcade presence at the time and using the aforementioned PlayChoice cabinets (which housed a modified NES), Super Mario Bros. would be an obvious choice to include as a part of the line-up. The PlayChoice also helped some walk away with the impression that NES titles were ‘arcade perfect’ as SMB looked exactly the same in this instance. From a marketing perspective, it was a very wise move and certainly helped fuel that fever in the US through the late 80s. 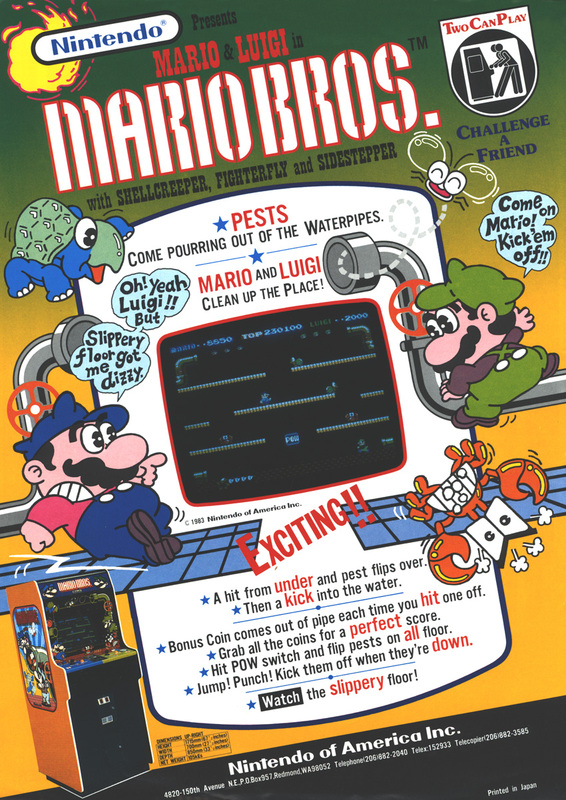 1986 – VS. Super Mario Bros. – Often overlooked is this unique arcade version of the NES game. Nintendo amped up the difficulty by throwing in more enemies, removing some of the power-up locations/secrets, removing some of the warp zones and including levels not found in the US home version that were included in Super Mario Bros. The Lost Levels. It made for a great conversion kit to promote a more challenging game for home users that had already played through the home version. 1988 – Super Mario Bros. 2 – I’ve heard SMB2 referred to as the “infamous” entry into the series and I do recall as a kid being somewhat baffled by it as I ran around pulling onions out of the ground. Nintendo would only give this the simple PlayChoice treatment for arcades, no special VS. edition to be found. 1988/90 – Super Mario Bros. 3 – Given my age, this was the first game that I recall getting the pre-release mass hype marketing push thanks to stuff like The Wizard. The arcade edition, like SMB2 wasn’t anything special, just designed to go into PlayChoice cabinets. 1990 – Dr. Mario & Vs. Dr. Mario – The popularity of the character and franchise took new turns with Mario jumping into the puzzle genre. At the time Tetris was big news and companies like Sega struggled to come up with a Tetris-killer (which in their case was Columns). Tetris had enjoyed a lot of success on the NES and would also drive Game Boy sales so Nintendo created something that they could call their own with Dr. Mario. This ran on the PlayChoice hardware and was also released as a Vs. Kit. 1991 – Super Mario World – Like the NES, the PlayChoice was aging quite a bit as the 90s rolled in and with a new home console out for consumers to buy, Nintendo also decided to give it a spin at the arcade with the Nintendo Super System. This odd cabinet featured deformed SNES controllers that would end up killing interest in the cabinet since they weren’t very reliable in an arcade environment (even harder to source parts for later on). 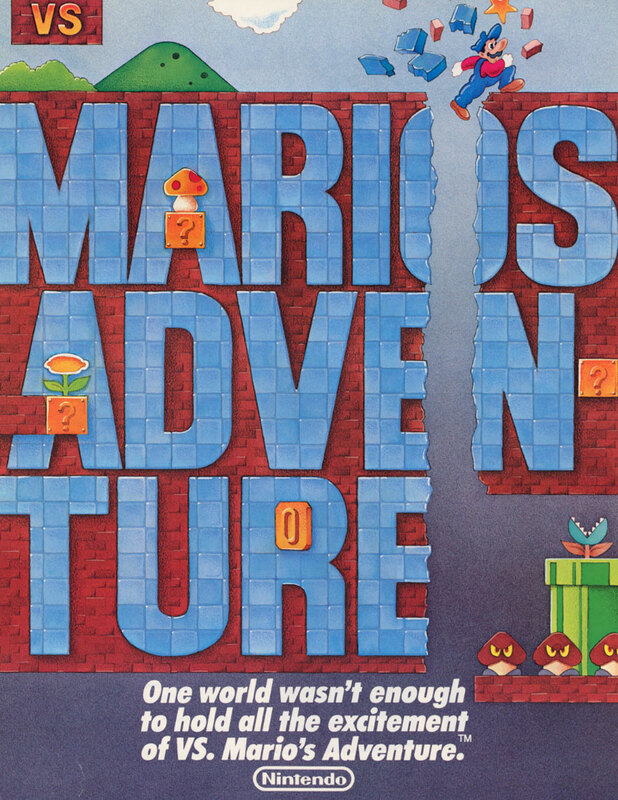 Either way, like PlayChoice, this allowed some popular home releases to find their way into the arcade, including Super Mario World. 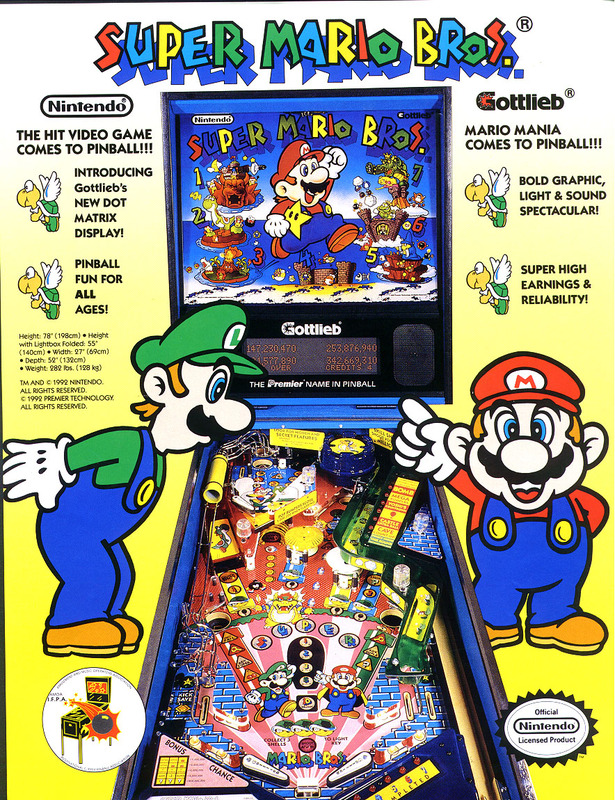 1992 –Super Mario Bros. Pinball – Pinball also got to enjoy some Super Mario action thanks to Gottlieb. 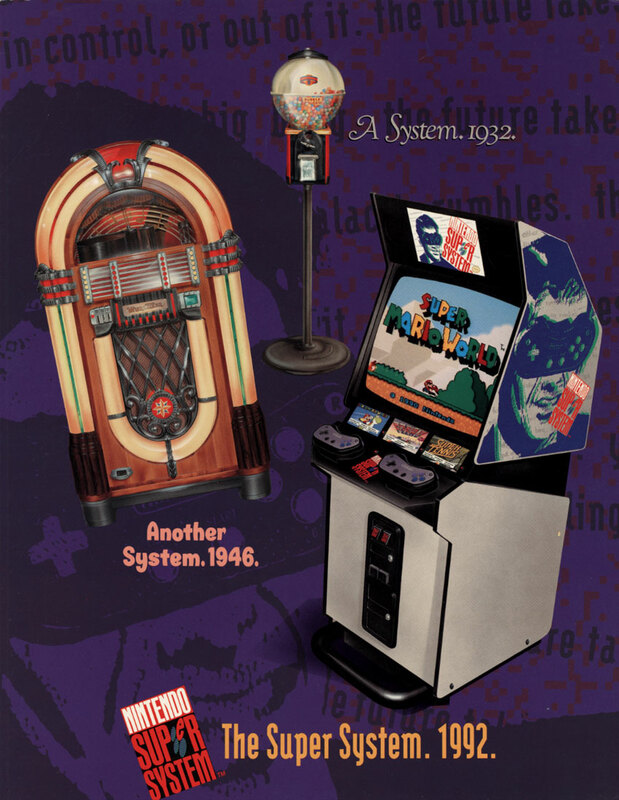 1992 was the year when pinball boomed, enjoying huge sales with titles like The Addams Family. The goal in this title was to rescue Princess Peach from Bowser once again but using pinball’s non-video game way of going about it. It wasn’t just the license that gave Gottlieb a reason to be excited, it also was their first game to use a monochromatic dot matrix video display (hot technology at the time…sadly most recent pinball releases are still stuck on 1 color). 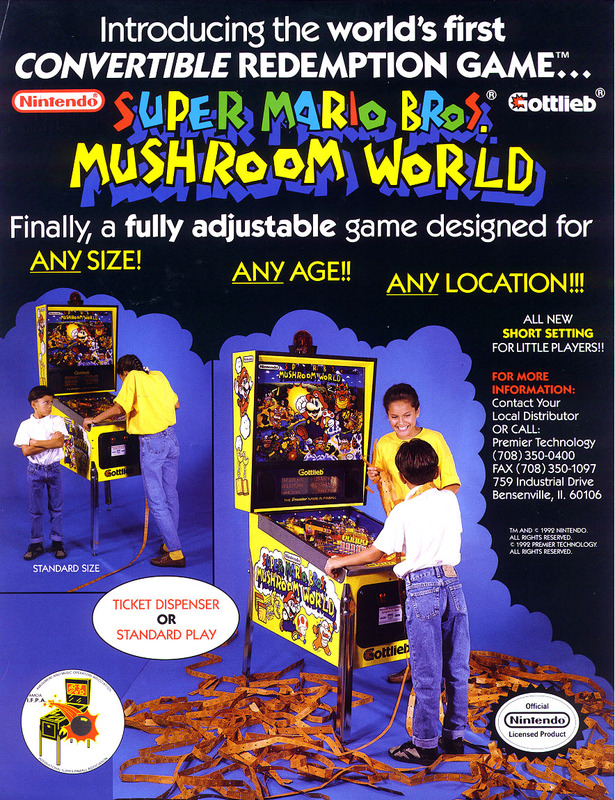 1992 – Super Mario Bros. Mushroom World Pinball – A few months later Gottlieb released a different version of the game with Mushroom World added to the title. They changed the playfield art and layout while adding something we’ve seen in recent times from Stern – ticket redemption. Since the game was geared towards kids and tickets, they gave it another interesting feature – they placed bolt holes higher up on the machine so the machine could be placed at a height better for kids to enjoy. This flyer cracks me up, as though switching the game to kids size would happen at the push of a button. While the PlayChoice and Super System models kept some Nintendo presence in the arcade, the company found themselves enjoying such success at home that they would dedicate few resources to creating exclusive arcade titles or experiences. As such Nintendo’s name was being found stamped on fewer machines as the 80s closed and the 90s went along. The Nintendo64 was not used as an arcade hardware variant (contrary to what the word on the street was about the “Ultra 64” hardware used in games like Killer Instinct), with companies like Capcom or Namco preferring to use PlayStation variants at the time. That changed in 2003 when Sega, Namco and Nintendo came together to create the Triforce board, based upon the Nintendo Gamecube (it featured more RAM and some I/O differences) . 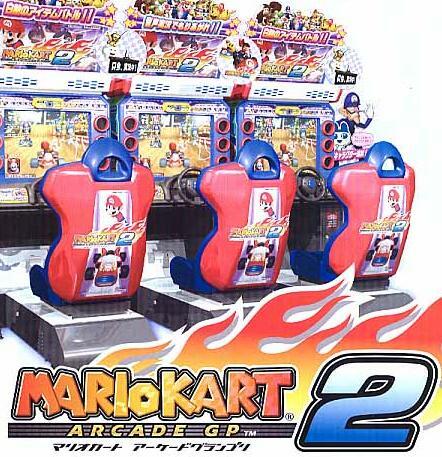 2005, 2007, 2014 – Mario Kart Arcade GP Series – While the Triforce hardware was used in several games starting in 2003, it would be a couple of years before Mario would arrive on the hardware. 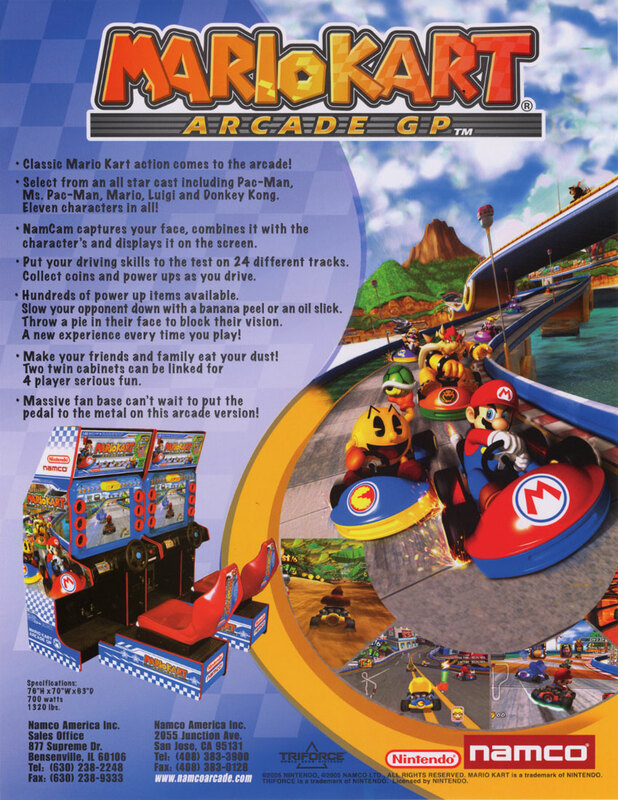 Working with Namco, this would bring the popular Mario Kart series to the arcade and it would remain there as officially none of the arcade Mario Kart versions have been released for home consoles. The way the games play is different, not just from having a steering wheel and pedals but how cups and continues would be handled. 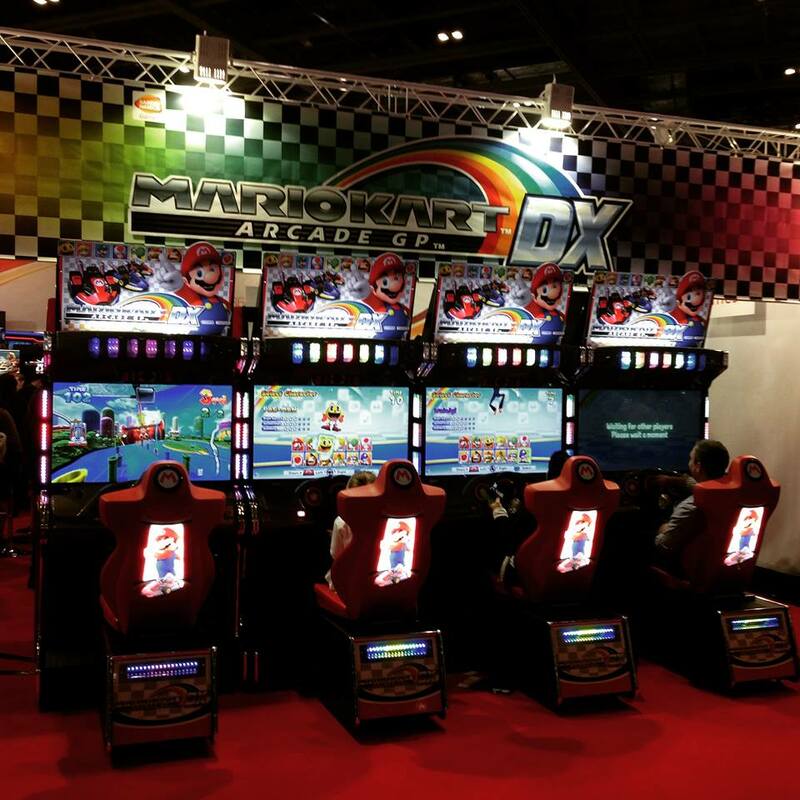 The most recent release, Mario Kart Arcade GP DX uses PC-based hardware but it is being manufactured for arcades and similar venues right now. Mario Kart Arcade GP DX – This title will feature online updates to keep content fresh, although I have only heard of those rolling out in Japan. So far we are still waiting for an update in the US. 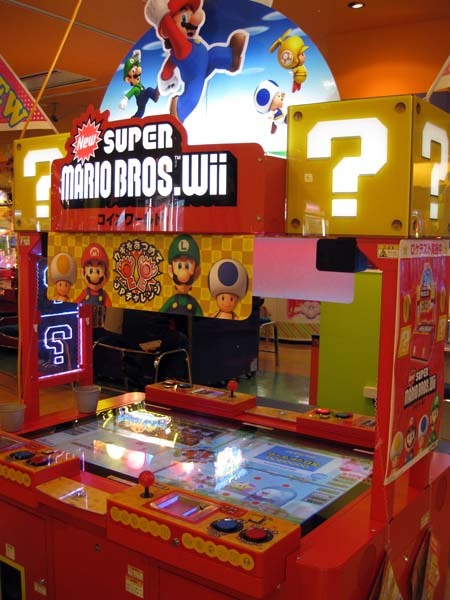 2011 – New Super Mario Bros. Wii Medal Edition – In Japan there is a class of machines called “medal games” which are pretty much like the ticket redemption we have in the USA. Some of these medal games become quite elaborate and tend to focus on providing fun to multiple players sitting around a table unit. In 2011, Capcom teamed up with Nintendo to offer NSMBW as one of these titles, with the large display split into four and some standard arcade joystick/button controls. 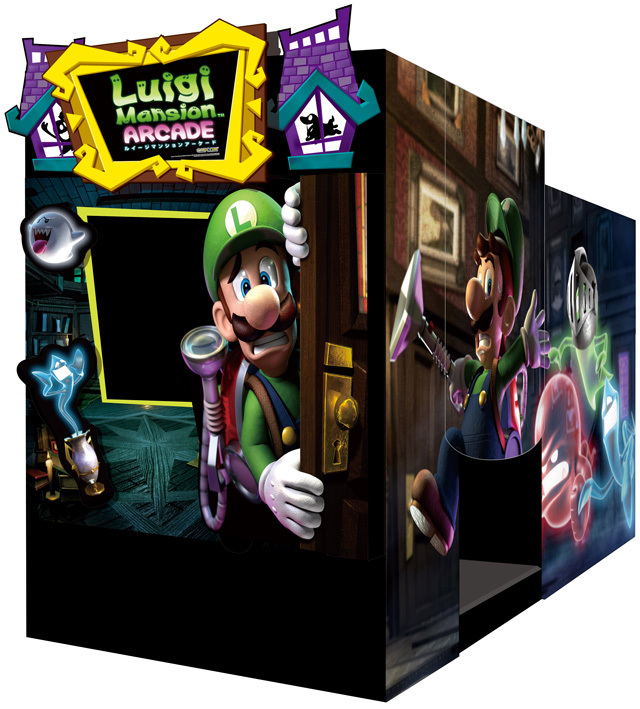 It is hard to predict what Nintendo might do at any time in their business, but they have appeared to be more open to working their IPs into arcades in recent times, as shown by the Mario Kart series but also the upcoming Luigi Mansion Arcade game (pictured below; at the moment that is only confirmed for Japan but I think there is a chance it could come to the States since Sega is apparently involved with it). Given the versatility of the character, we could always see Nintendo license out some kind of new concept for Namco or Sega to run with. What would you like to see? What is your favorite Mario title of them all? I have no idea what my favourite Marino title is but if you mean plat former then I’m probably going to pick super Marino world for the snes. Anything with Mario in it applies 🙂 I imagine there is a lot of concepts that would work with Mario added into the mix since he has been featured in so many different game types over the decades. 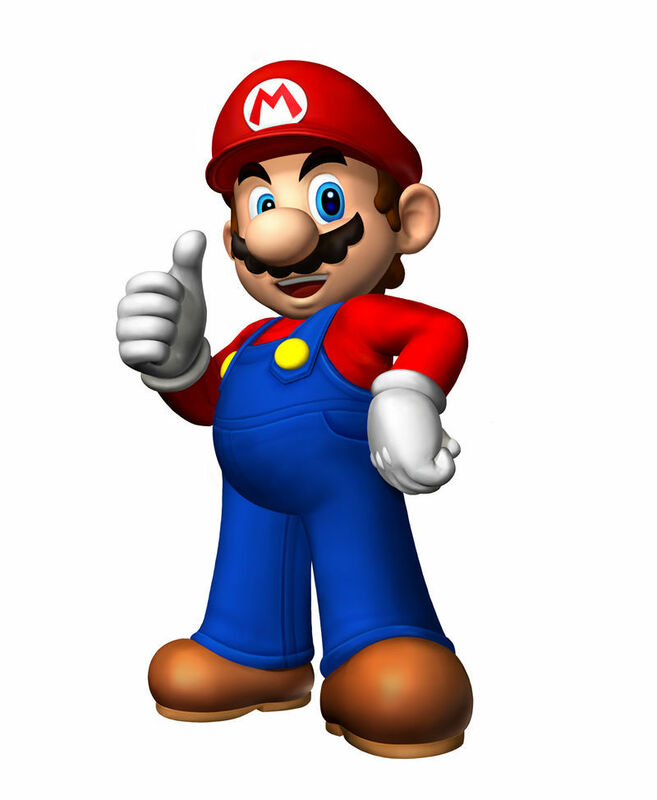 Tell Nintendo to be serious and port a version of New Super Mario Bros. to the arcades. Let’s be real about it this time, no gimmick crap. Wasn’t really looking too much into the redemption games (most aren’t terribly interactive) but I can put those in there – once I get the Sega anniversary article done. Thanks! This article is so rad. I just kinda stumbled upon this website and now you have gained yourself another reader. A+.